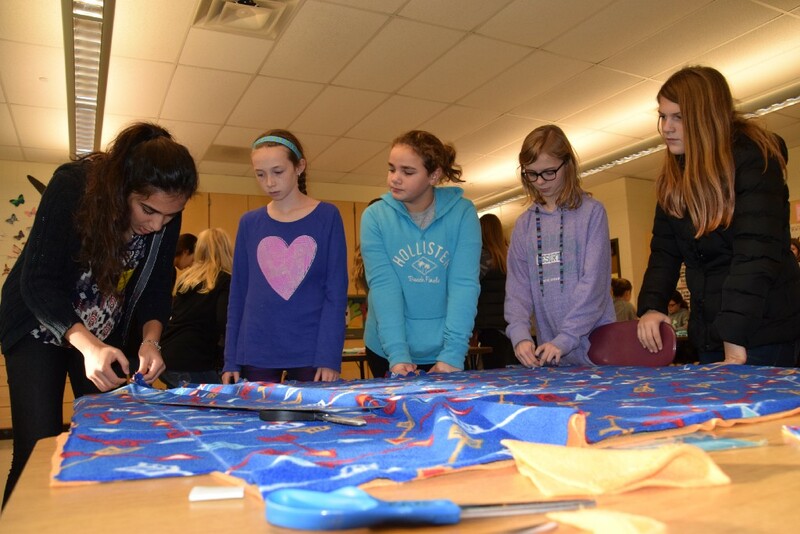 UES and MHS students came together on Monday, Nov. 20 to create no-sew fleece blankets for the needy. Amaal Khan shows a group of Upper Elementary School students how to weave a no-sew blanket as a part of Project: Blanket Buddiezz, which was held at the Upper Elementary School on Monday, Nov. 20. Last September, as Amaal Khan’s 16th birthday approached, her parents asked her how she wanted to celebrate. Her mother, Huma, said the family had allocated funds for each of the three Khan children to host a 16th birthday celebration. Huma said she asked her daughter if she wanted to rent a limo or do something else special for the milestone, and she was pleasantly surprised by Amaal’s reply. “I wanted to put the money toward a good cause,” Amaal said. On Monday, Nov. 20, fourth through sixth graders at the Upper Elementary School, alongside members of Moorestown High School’s Interact Club, fulfilled Amaal’s hope of putting the funds toward a good cause. 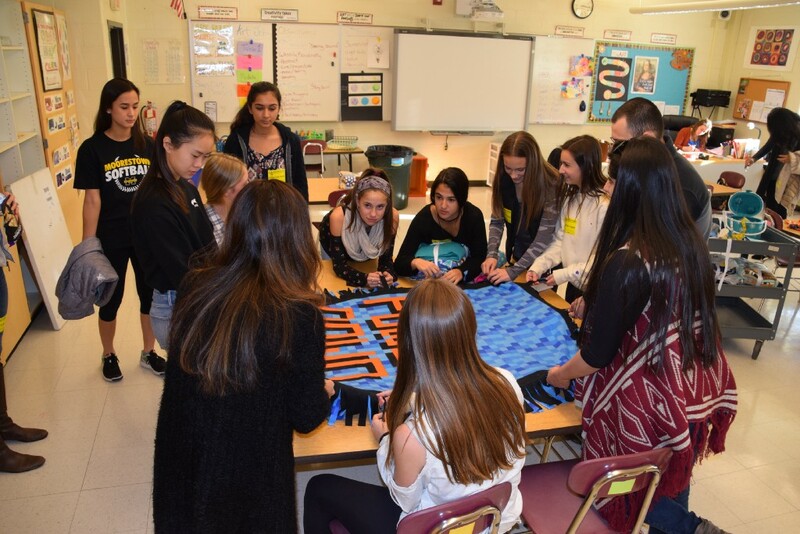 Project: Blanket Buddiezz had students working in teams to weave no-sew fleece blankets to be delivered to Providence House, a center for victims of domestic abuse and children in Westampton. The idea came about nearly a year after Amaal’s 16th birthday. With no specific idea in mind other than to use the funds for something charitable, the Khans put the money aside. A year went by, and Huma said she reminded Amaal they had this money laying dormant and asked her what she wanted to do with it. Around that same time, the weather was getting colder and Amaal’s brother, Zayb, had pulled out a blanket he had received prior to his eye surgery. As Huma looked at the blanket, inspiration struck. Huma looked at the blanket and reminded her children that they had the money set aside to put toward a good cause. She said her son voiced exactly what she had been thinking — blankets for those in need. The blanket had provided Zayb with a sense of comfort following his surgery, and so the family wanted to provide that same sense of warmth and well-being to someone else, Huma said. 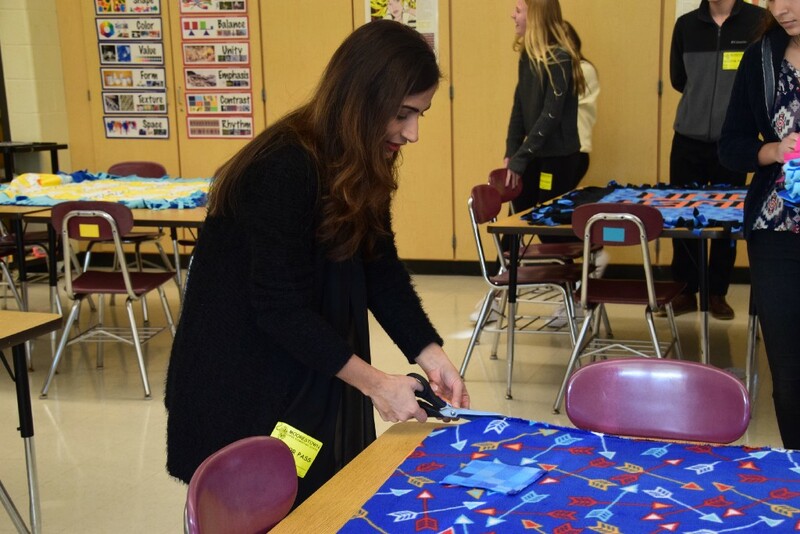 Members of Moorestown Hg School’s Interact Club were eager to volunteer their time to help create no-sew blankets for the homless. Project: Blanket Buddiezz was held at the Upper Elementary School on Monday, Nov. 20 with each blanket requiring teams of students to weave. So Huma approached her two youngest children, Zayb, 9, and Zaara, 11, and asked if they would be willing to follow in their sister’s footsteps and sacrifice their birthday money as well. She was delighted when they agreed. With Zayb and Zaara already involved in the Live Civilly Community Service Club at the UES, Huma reached out to Live Civilly to see if the group might be interested in a partnership. Meanwhile, Amaal, a member of MHS’ Interact Club, extended the invitation for club members to participate. So on Monday, Nov. 20, high school and upper elementary school students wove fabric provided by the Khan family into ten no-sew blankets for the needy. Khan, who enjoys sewing in her free time, gave the students a 10-minute tutorial on how to cut fringe strips into fleece and how to tie knots to create the blankets. She said she was impressed by how quickly everyone in attendance picked it up. Moorestown mom Huma Khan demonstrates how to measure and cut the materials for the no-sew blankets. Khan and her three children brought Project: Blanket Buddiezz to Upper Elementary School on Monday, Nov. 20. Taylor Kares, a freshman at MHS, said giving back is of special importance to her around this time of year. She said not everyone is fortunate enough to have a home or blankets to keep them warm, so doing something small, such as making a blanket, is a fulfilling way to help make the holiday season a little warmer for someone in need. She said the blanket weaving was in, many ways, a metaphor for the groups coming together to make the project possible. “Each blanket takes a lot of work; it’s a team effort, so that everyone is involved and that just shows our community coming together and helping people out so that everyone is warm for the holidays,” she said. Barr echoed the sentiment, saying the blankets, which required several people to weave, taught students a valuable lesson in teamwork. Moorestown Board of Education member Caryn Shaw said a friend alerted her to the project, and she reached out to some of her daughter’s friends at MHS to get involved. Shaw said she’s always been a firm believer in setting a precedent for volunteerism from a young age, and for that reason, she was excited by the prospect of something that got kids at the UES volunteering early on. 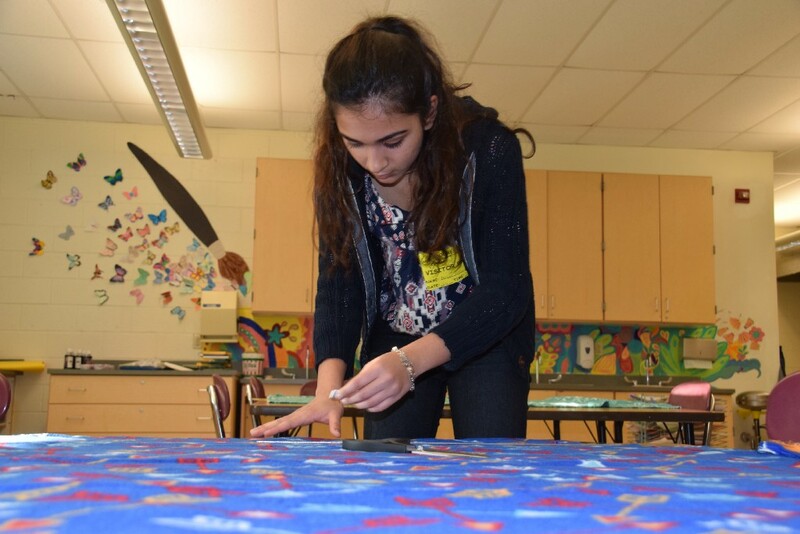 Amaal Khan begins work on a no-sew blanket to be donated to the homeless. Khan donated the funds allocated for her sixteenth birthday to finance Project: Blanket Buddiezz, which was held at the Upper Elementary School on Monday, Nov. 20. Khan said for her, the project boils down to teaching younger kids to give back. She said the hope is if you get kids started volunteering early, then they’ll continue giving back as they get older. Khan said she is eager to do the project again. She said if they can find a way to continue funding the project, she’d help make Project: Blanket Buddiezz an ongoing basis.